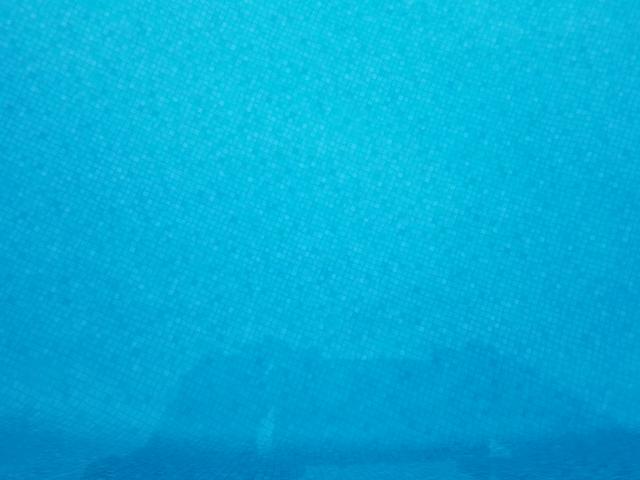 Every time I go into a pool store for something, and tell them that I use bleach, or liquid chlorine, they say that I am going to burn out the print on my liner with it... to which, I pull out my phone, and show them what THEIR shock did to the pool liner when used by people that just bought it, and FOLLOWED THEIR INSTRUCTIONS to just throw it in! Then I show them my liner as it is now, and ask if they have any more uninformed opinions that they would like to share. Needless to say that they then shut up, and ring up my purchase. 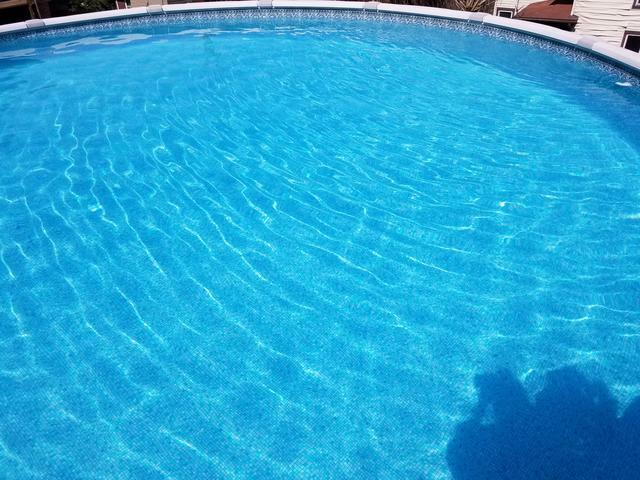 I JUST opened my pool... CLEAN water! I LOVE you guys! Since I have found you, you have done nothing but help me! I know they looked at me strangely. I'm ok with it because I know TFPC works! I just went out and checked my FC. 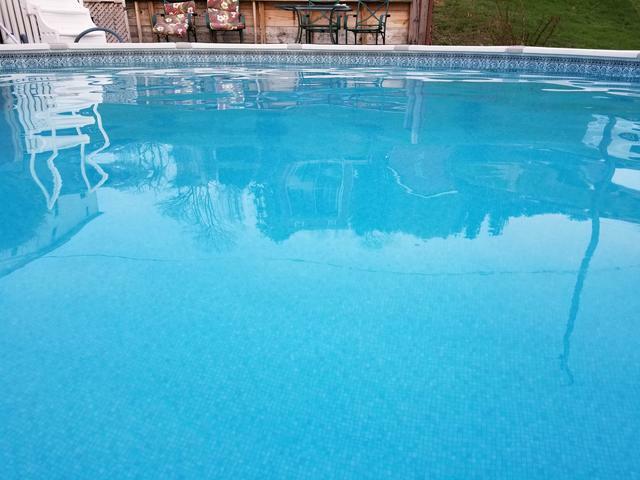 I also brushed the bottom of the pool because of fine sediment on the bottom after sweeping. I'll do my walls later this evening after sweeping it one more time today. I have to go take a break and get my little girl. 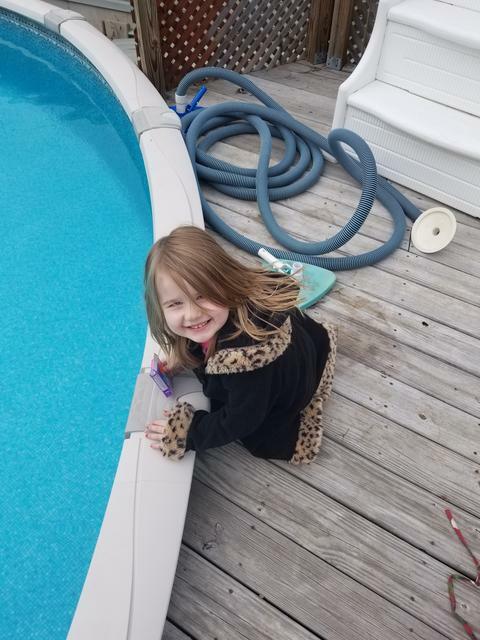 She is going to be so happy to see her pool. Casey knows how to perform a textbook SLAM. Nice! This should go in the "how to slam" book. It's gone so fast! I'm blown away by how quickly it's gone! I hope to be able to pass an OCLT in a couple days! The clarity just isn't there yet. I have to brush the walls tonight and I'll sweep tomorrow. I'll be testing again here in a little bit after dinner too. I'm very pleased and if you want to add this SLAM to record SLAM's I'd be honored! Someone approves of a job well done! Just over 48 hours in and I've got a nearly perfect pool! This would have been a good pool to have had one of those GoPro cameras setup where you do continuous video and you take 72 hours of footage from above the pool and compress it down to a 45sec video. On a side note... Always, Always, Always make sure that skimmer socks are removed before you add a lb or 2 of DE filter media! I had to rip it off just to get the basket out because it was not pulling out with the pump off. Casey can you go on the record and tell us how often you tested and dosed in the first 12 hours of your SLAM. Look at that happy smile! 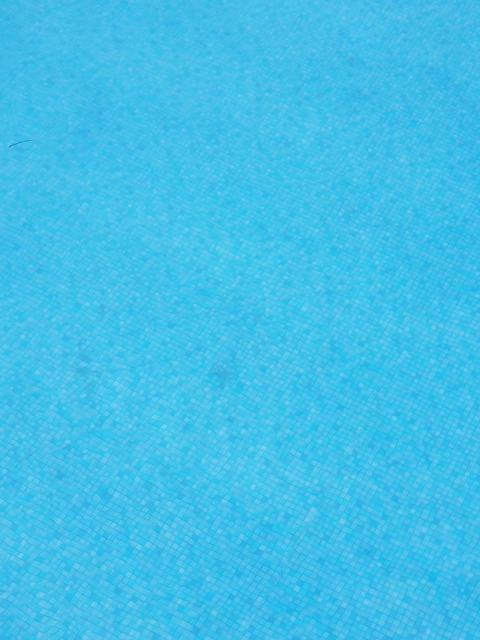 Look at MY pool! LOVE IT! Nice job on the slam...why aren’t they all this easy? Lol. They also told me that if you put pH decreased on an organic stain, it would lift it. I don't know if that's true or not but it sounded weird. No TFPers doing a slam would ever have FC low enough to need to spot treat an organic stain...so not sure there either. They might be getting confused with Metal treatments ... dry acid works on copper in particular. It’s a good way to spot treat a copper stain. I tested pH 3 times before my SLAM. Once I started the SLAM on 4/19/18 at 6:45pm, I tested 2 times that evening. On 4/20/18 I tested my FC 4 times I think? Today, I tested my water 3 times so far but it'll be 4 times by tonight. 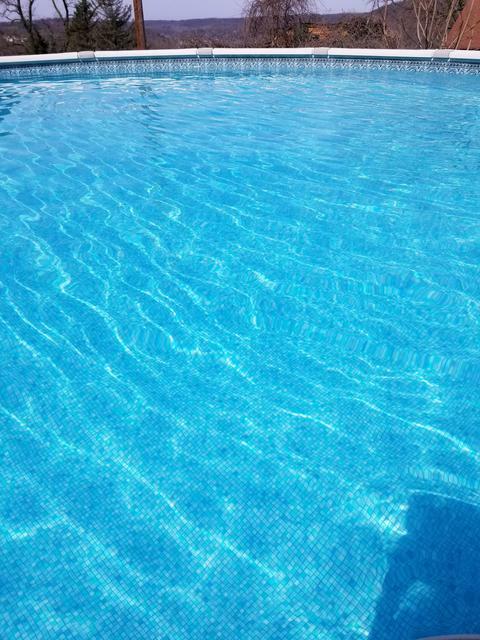 In total, I've only used 7g of 10% liquid chlorine. That is it! In the first 12 hours though, I only used 2 g for initial dose and one before i went to bed. I used 2 1/2 yesterday throughout the day and 1 1/2 today. I will be going for an OCLT tomorrow night. I am just 48hrs into this SLAM. I thought it'd take longer but here I am looking at a crystal clear pool. I'm SHOCKED... or maybe I'm just SLAMMED!!! Kim, She was very upset over the condition of her pool. She even told me that I had to buy her a new one. I told her I'd fix it. She was very happy today seeing it clean. I have to say that I am too. I thought it'd take longer but 48 hours... I'm impressed. Did you end up getting all of the stuff out of your hose? and how? Around 13k g or so. I probably over shot my FC a little. Lol I just checked my CYA and it's at 20. I've been aiming for an FC of 12-15. I'm sitting with an FC of 12.5ppm right now. Yes I did get the leaves out of the hose. I left one end of the hose out of the pool n put the other end on the return and blew the leaves out. 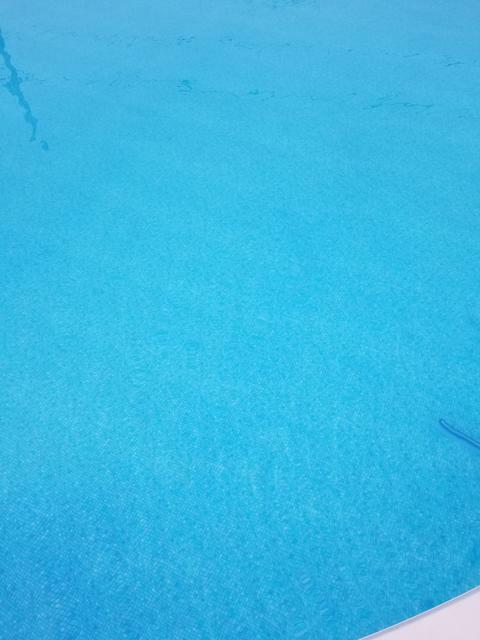 I need to get my drone up over YOUR pool, and get a picture of it from above! How did it clear up so fast? It takes me days to complete a SLAM. 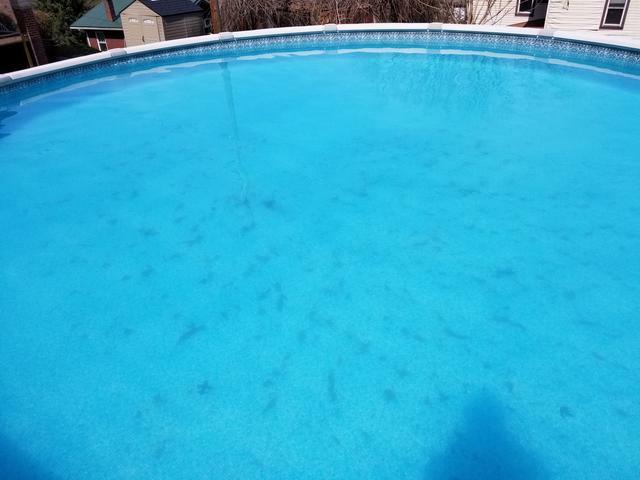 I am going to say it's probably due to my DE Filter and the fact that I blew through a 25lb bag of DE in 2 days, removing 90% of organic material before the SLAM, testing and dosing of the pool, brushing and sweeping and backwashing my filter a lot. Canjones, I have a theory about why some slams go fast...I think when you’ve spent as much time on this forum as some guides have, you completely understand that any minute you’re below your true slam level, you’re not actually slamming. I'm not sure less experienced folks fully grasp this. I had a blackwater foreclosure swampthat first brought me to tfp in 2012. My slam wasn’t quite this fast as I was a newbie, but once I dialed into the tfp way I actually nailed it in under a week - total was 12 days and the first several were scooping and mucking about with pool techs originally hired for the job. I’d had so much ammonia you could smell it IN THE HOUSE when we took the cover off. BUT it was still cold - which was in my favor... and I kept it above slam level religiously and it went faster than most swamp level recoveries I see. So when tfp says close late and open early, there’s yet another benefit: if you slam before algae growth conditions are ideal, your slam will be faster if all other things are equal. You have to hit it hard and keep up the SHOCK LEVEL AND MAINTAIN it. Less than 72 hours in and I'll be performing an OCLT tonight. A few pictures from the last 4 morning's. This morning's test results never budged from last night's but I'll still run the OCLT. 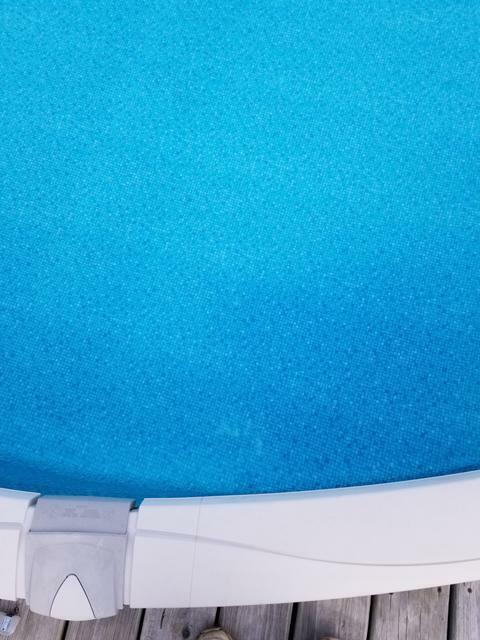 A DE filter is a blessing and a curse - DE will help clear fine particulates quickly but it can easily get clogged in the early clearing phase when there is a lot of algae load. With Casey being able to vacuum to waste, she got rid of a lot of the heavier debris and saved herself a lot of time. In the industry, the preferred method is to shock and floc whereby you drop the pH, hit the pool with a huge chlorine load, kill everything and then floc it all to the bottom. This is all done with the filter set to recirculate. Once the floc drops everything, you then do a slow vacuum to waste. 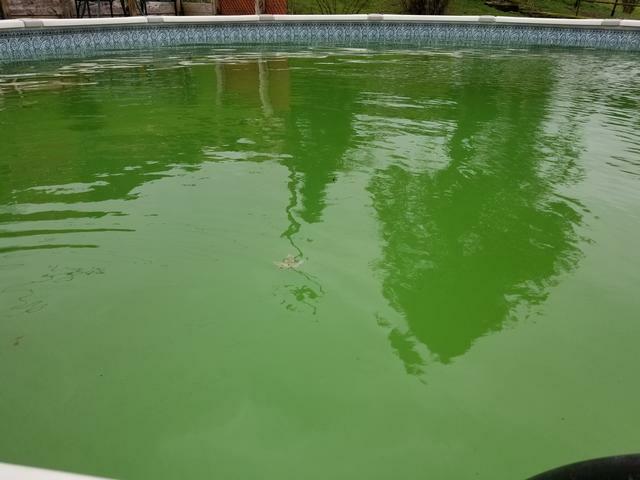 The problem is the folks in the industry don’t keep at it with adequate chlorine levels until everything is killed and so, even though they cleared the pool, it’s still likely for it to cloud up with algae again. Also, the shock & floc method requires a multiport valve and not a lot of pools with cartridge or DE filter have those. The final clearing phase is always the hardest and longest for sand filter pools and so patience is key. It’s not a bad idea for sand filter owners to use DE in those later stages to help clear up the water faster. Thanks guys. 10 + years of being here at TFP has taught me a thing or 2. I've been waiting for the sun to cut the water and make it sparkle. Less than 72 hours and I've achieved a sparkly oasis! As Matt said, the DE filter is a blessing and a curse. I had to make sure I did not start until I could dedicate my life to the filter. I went through 25lbs of DE filter media because the filter built pressure like no one's business. It needed baby sat, bumped and cleaned several times a day. Vacc'ing to waste was the best decision made before hand that made this process go along very quickly. Getting all that organic material off the bottom gave me an advantage on the SLAM. 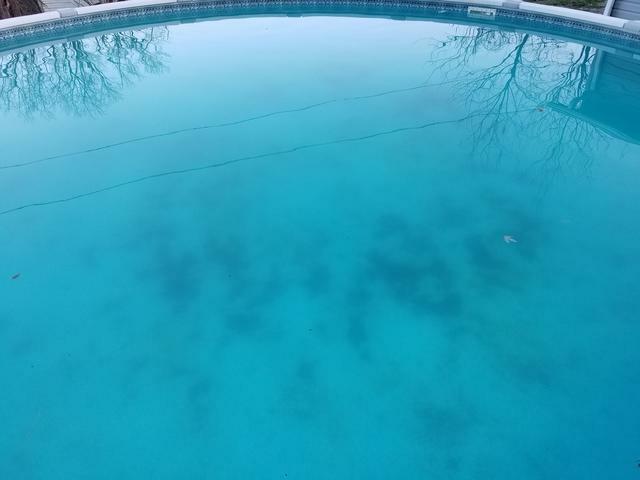 The chlorine was able to kill the algae instead of decomposing vegetation and killing algae. I can tell you all one thing... I'll never do that again as easy as I made it look! I'll hire someone to come out and put the cover on if I can't do it. One more test tonight n I'm calling this a successfully completed SLAM in 72 hours!